Veggie-packed, plant-powered goodness, these rolls make the perfect quick lunch paired with your favorite bean or veggie soup! Heat wraps for 10 to 20 seconds in the microwave. Use this No-Oil Nutritarian Hummus recipe. Depending on the diameter of your wrap, spread each with 3 to 4 tbsp. hummus. 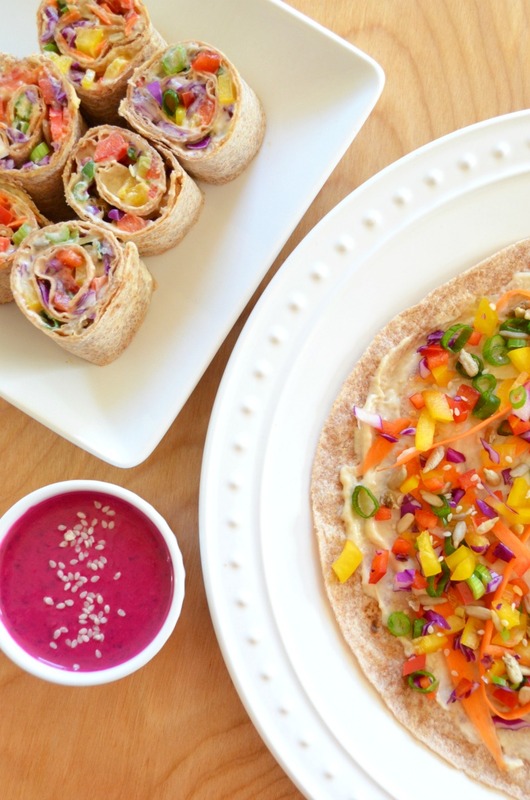 Divide veggies and sprinkle on top of the hummus on each wrap. Make sure to stop your veggies about 2 inches down from the edge of the tortillas (this will help the wraps seal up better). Starting on the opposite end of where you left a gap, roll upwards tightly and press down to seal. Eat as whole wraps or cut into 1 1/2 to 2 inch pieces to make sushi-like rolls! Serve with your favorite plant-based dip (like this No-Oil Beet Hummus Dressing) or eat with your favorite soup!